African foam nesting frogs represent one of the most extreme examples of polyandry in a vertebrate and this is thought to be a fertility insurance mechanism. Our paper, just published online, shows that offspring from polyandrous matings had both significantly higher mean survival and reduced variance in offspring survival. We suggest that this is due to genetic benefits, but appropriately designed cross-fostering experiments are required to confirm this. The paper can be accessed here: http://beheco.oxfordjournals.org/content/early/recent. Also, to learn more about this species, click here: Byrne PG, Whiting MJ. 2008. 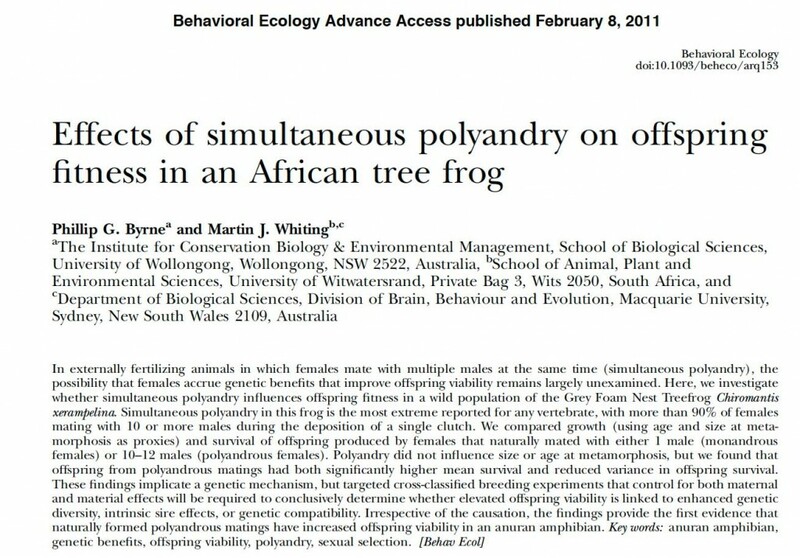 Simultaneous polyandry increases fertilization success in an African foam-nesting treefrog. Anim Behav. 76:1157–1164. See amazing photos of these frogs in action!